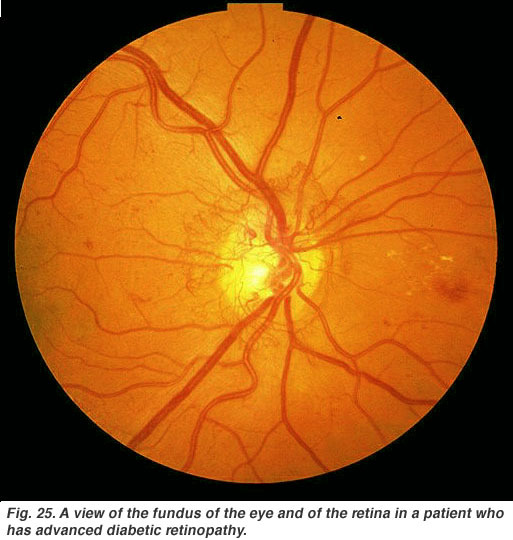 When an ophthalmologist uses an ophthalmoscope to look into your eye he sees the following view of the retina (Fig. 1). In the center of the retina is the optic nerve, a circular to oval white area measuring about 2 x 1.5 mm across. From the center of the optic nerve radiates the major blood vessels of the retina. Approximately 17 degrees (4.5-5 mm), or two and half disc diameters to the left of the disc, can be seen the slightly oval-shaped, blood vessel-free reddish spot, the fovea, which is at the center of the area known as the macula by ophthalmologists. A circular field of approximately 6 mm around the fovea is considered the central retina while beyond this is peripheral retina stretching to the ora serrata, 21 mm from the center of the retina (fovea). The total retina is a circular disc of between 30 and 40 mm in diameter (Polyak, 1941; Van Buren, 1963; Kolb, 1991). The retina is approximately 0.5 mm thick and lines the back of the eye. 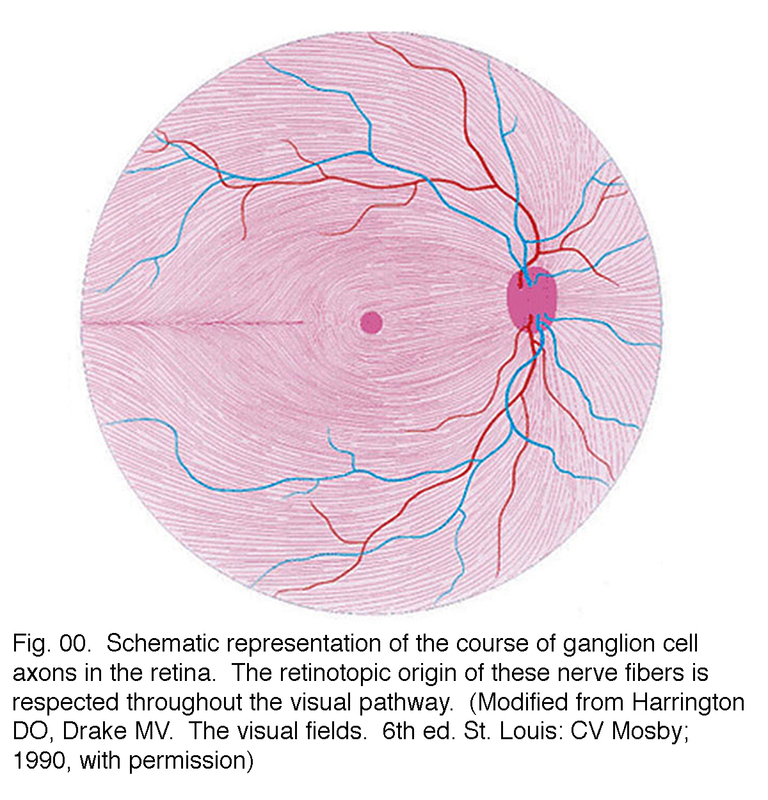 The optic nerve contains the ganglion cell axons running to the brain and, additionally, incoming blood vessels that open into the retina to vascularize the retinal layers and neurons (Fig. 1.1). 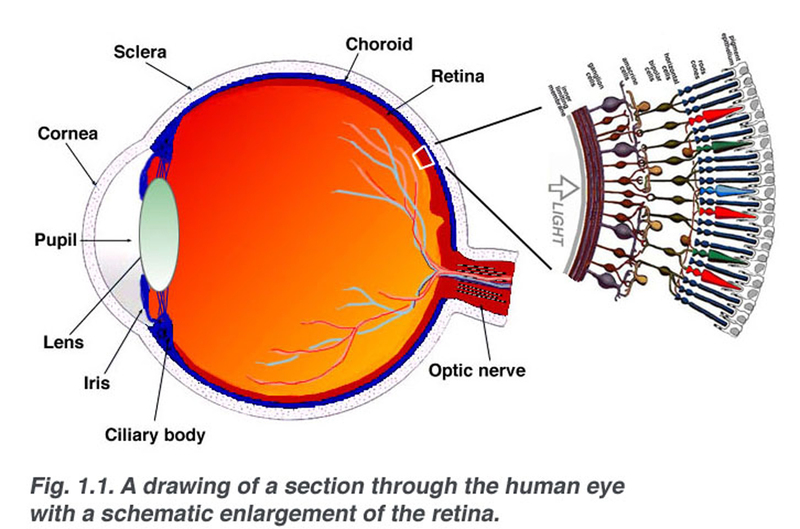 A radial section of a portion of the retina reveals that the ganglion cells (the output neurons of the retina) lie innermost in the retina closest to the lens and front of the eye, and the photosensors (the rods and cones) lie outermost in the retina against the pigment epithelium and choroid. Light must, therefore, travel through the thickness of the retina before striking and activating the rods and cones (Fig. 1.1). Subsequently the absorbtion of photons by the visual pigment of the photoreceptors is translated into first a biochemical message and then an electrical message that can stimulate all the succeeding neurons of the retina. The retinal message concerning the photic input and some preliminary organization of the visual image into several forms of sensation are transmitted to the brain from the spiking discharge pattern of the ganglion cells. 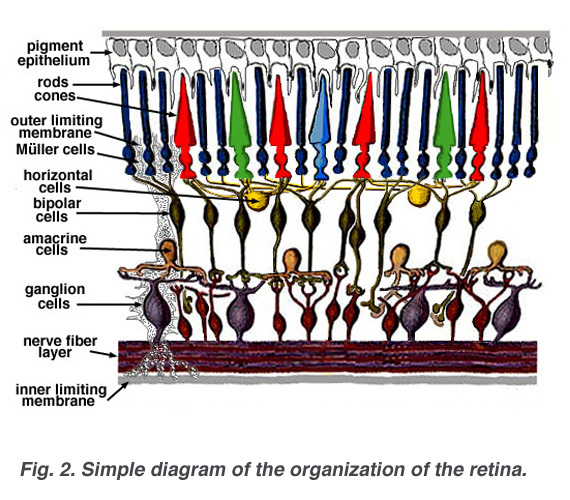 A simplistic wiring diagram of the retina emphasizes only the sensory photoreceptors and the ganglion cells with a few interneurons connecting the two cell types such as seen in Figure 2. When an anatomist takes a vertical section of the retina and processes it for microscopic examination it becomes obvious that the retina is much more complex and contains many more nerve cell types than the simplistic scheme (above) had indicated. 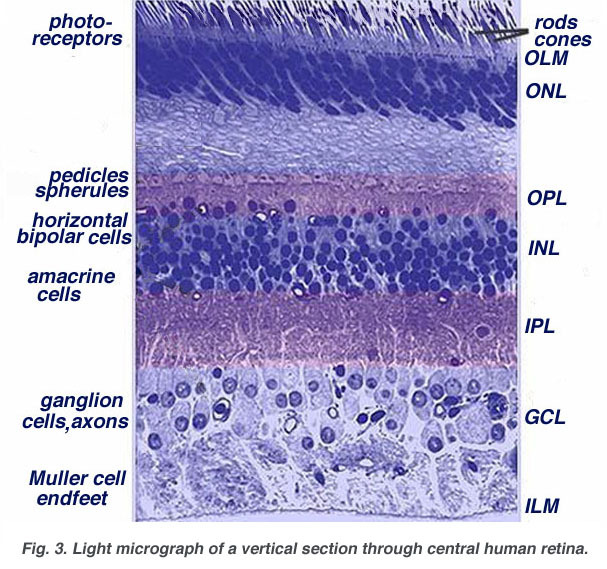 It is immediately obvious that there are many interneurons packed into the central part of the section of retina intervening between the photoreceptors and the ganglion cells (Fig 3). All vertebrate retinas are composed of three layers of nerve cell bodies and two layers of synapses (Fig. 4). The outer nuclear layer contains cell bodies of the rods and cones, the inner nuclear layer contains cell bodies of the bipolar, horizontal and amacrine cells and the ganglion cell layer contains cell bodies of ganglion cells and displaced amacrine cells. 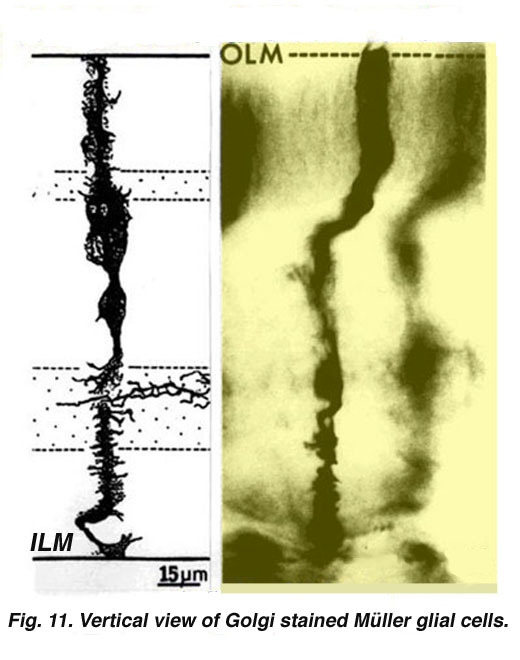 Dividing these nerve cell layers are two neuropils where synaptic contacts occur (Fig. 4). The first area of neuropil is the outer plexiform layer (OPL) where connections between rod and cones, and vertically running bipolar cells and horizontally oriented horizontal cells occur (Figs. 5 and 6). 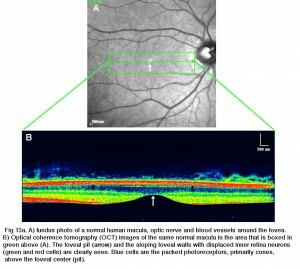 The second neuropil of the retina, is the inner plexiform layer (IPL), and it functions as a relay station for the vertical-information-carrying nerve cells, the bipolar cells, to connect to ganglion cells (Figs. 7 and 8). In addition, different varieties of horizontally- and vertically-directed amacrine cells, somehow interact in further networks to influence and integrate the ganglion cell signals. It is at the culmination of all this neural processing in the inner plexiform layer that the message concerning the visual image is transmitted to the brain along the optic nerve. 2. 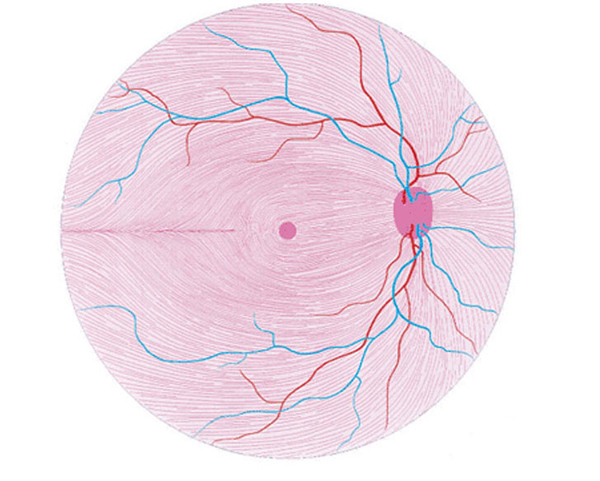 Central and peripheral retina compared. 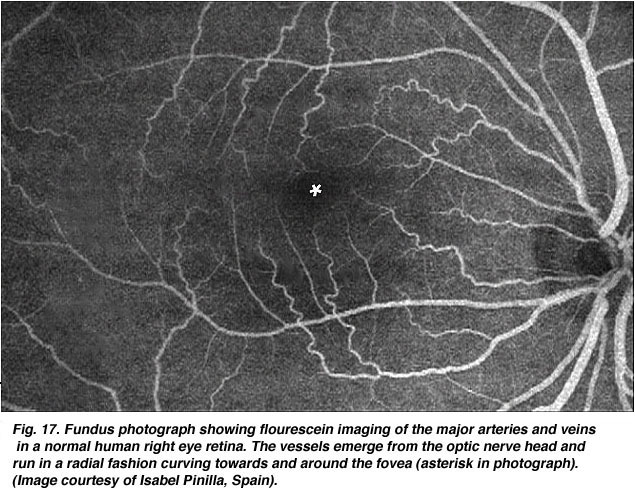 Central retina close to the fovea is considerably thicker than peripheral retina (compare Figs. 9 and 10). This is due to the increased packing density of photoreceptors, particularly the cones, and their associated bipolar and ganglion cells in central retina compared with peripheral retina. Central retina is cone-dominated retina whereas peripheral retina is rod-dominated. Thus in central retina the cones are closely spaced and the rods fewer in number between the cones (Figs. 9 and 10). The outer nuclear layer (ONL), composed of the cell bodies of the rods and cones is about the same thickness in central and peripheral retina. However in the peripheral the rod cell bodies outnumber the cone cell bodies while the reverse is true for central retina. 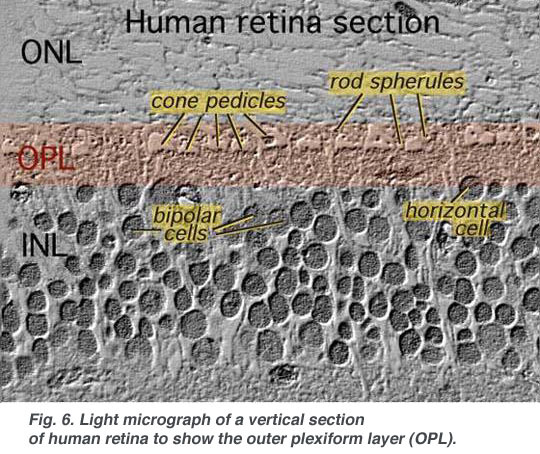 In central retina, the cones have oblique axons displacing their cell bodies from their synaptic pedicles in the outer plexiform layer (OPL). These oblique axons with accompanying Muller cell processes form a pale-staining fibrous-looking area known as the Henle fibre layer. The latter layer is absent in peripheral retina. 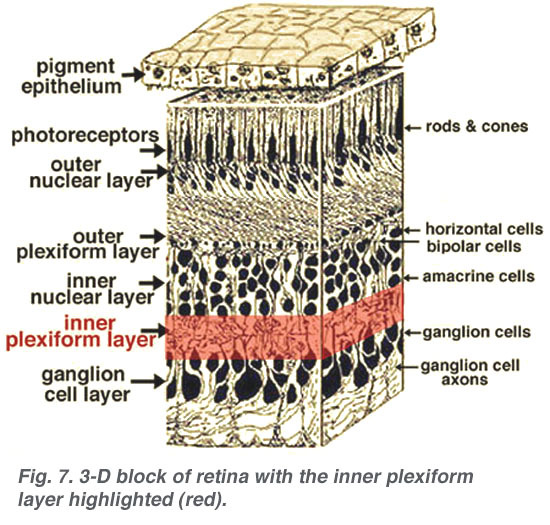 The inner nuclear layer (INL) is thicker in the central area of the retina compared with peripheral retina, due to a greater density of cone-connecting second-order neurons (cone bipolar cells) and smaller-field and more closely-spaced horizontal cells and amacrine cells concerned with the cone pathways (Fig. 9). As we shall see later, cone-connected circuits of neurons are less convergent in that fewer cones impinge on second order neurons, than rods do in rod-connected pathways. 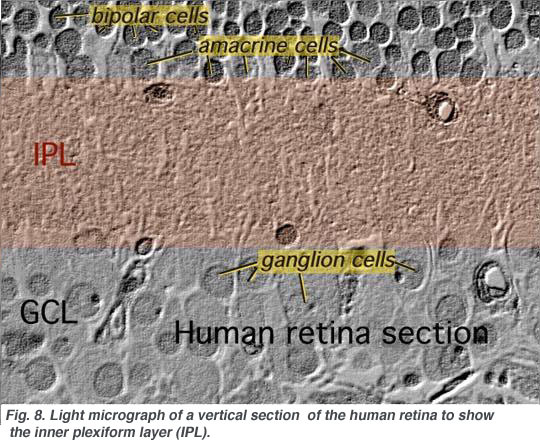 A remarkable difference between central and peripheral retina can be seen in the relative thicknesses of the inner plexiform layers (IPL), ganglion cell layers (GCL) and nerve fibre layer (NFL) (Figs. 9 and 10). This is again due to the greater numbers and increased packing-density of ganglion cells needed for the cone pathways in the cone-dominant foveal retina as compared the rod-dominant peripheral retina. 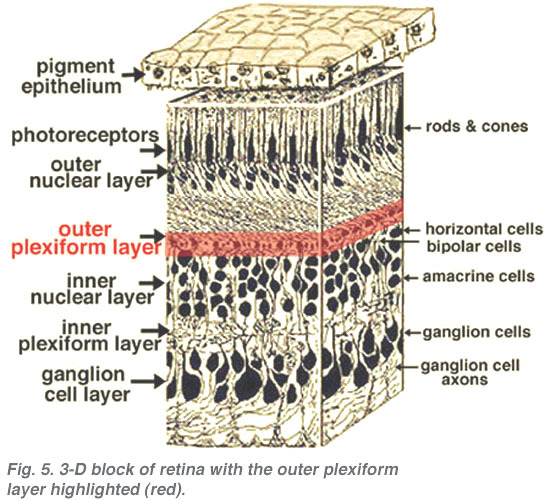 The greater number of ganglion cells means more synaptic interaction in a thicker IPL and greater numbers of ganglion cell axons coursing to the optic nerve in the nerve fibre layer (Fig. 9). Muller cells are the radial glial cells of the retina (Fig. 11). The outer limiting membrane (OLM) of the retina is formed from adherens junctions between Muller cells and photoreceptor cell inner segments. The inner limiting membrane (ILM) of the retina is likewise composed of laterally contacting Muller cell end feet and associated basement membrane constituents. 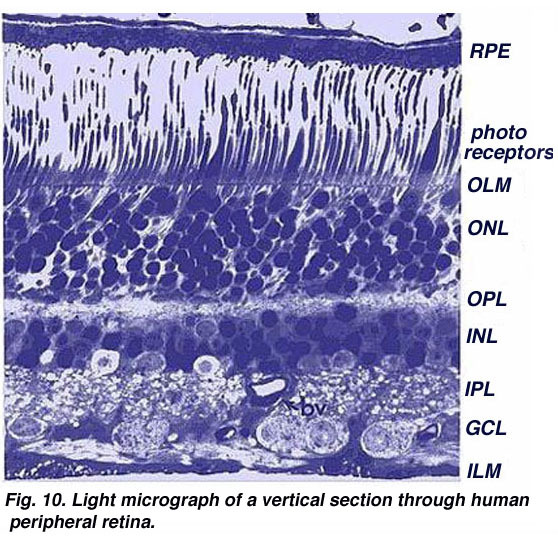 The OLM forms a barrier between the subretinal space, into which the inner and outer segments of the photoreceptors project to be in close association with the pigment epithelial layer behind the retina, and the neural retina proper. The ILM is the inner surface of the retina bordering the vitreous humor and thereby forming a diffusion barrier between neural retina and vitreous humor (Fig. 11). 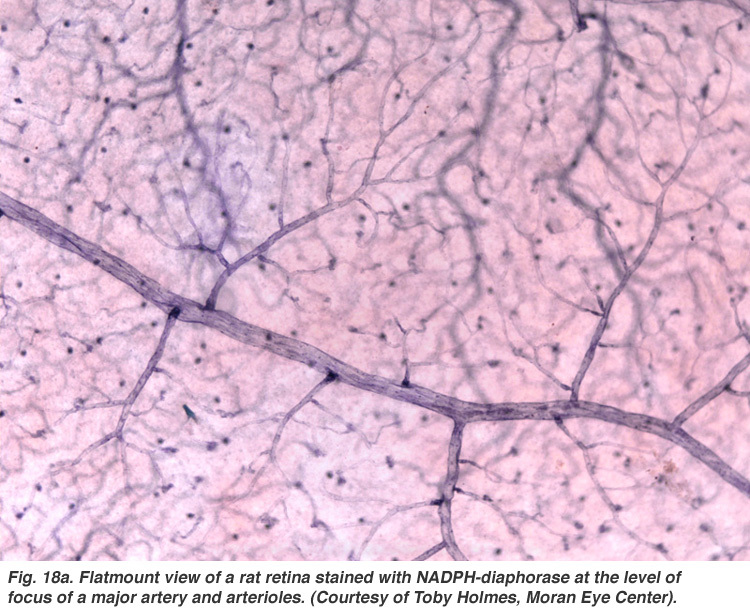 Throughout the retina the major blood vessels of the retinal vasculature supply the capillaries that run into the neural tissue. Capillaries are found running through all parts of the retina from the nerve fibre layer to the outer plexiform layer and even occasionally as high as in the outer nuclear layer. 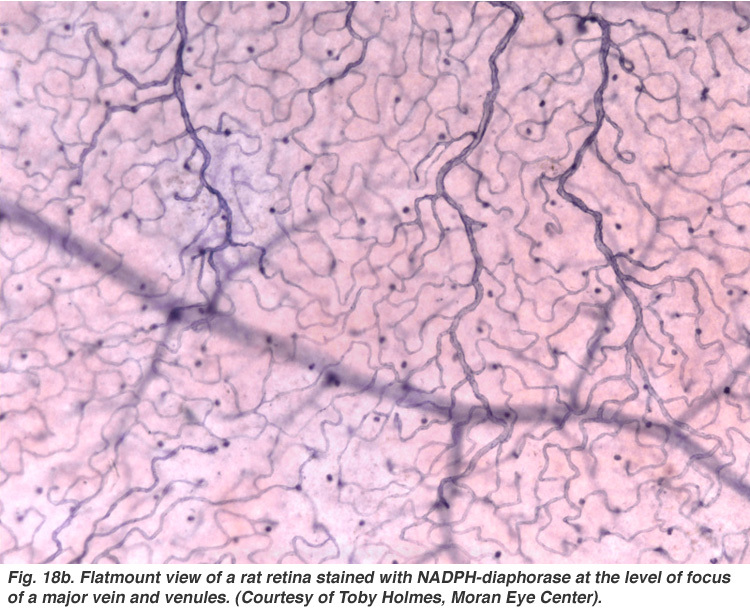 Nutrients from the vasculature of the choriocapillaris (cc) behind the pigment epithelium layer supply the delicate photoreceptor layer. The center of the fovea is known as the foveal pit (Polyak, 1941) and is a highly specialized region of the retina different again from central and peripheral retina we have considered so far. Radial sections of this small circular region of retina measuring less than a quarter of a millimeter (200 microns) across is shown below for human (Fig. 12a) and for monkey (Fig.12b). 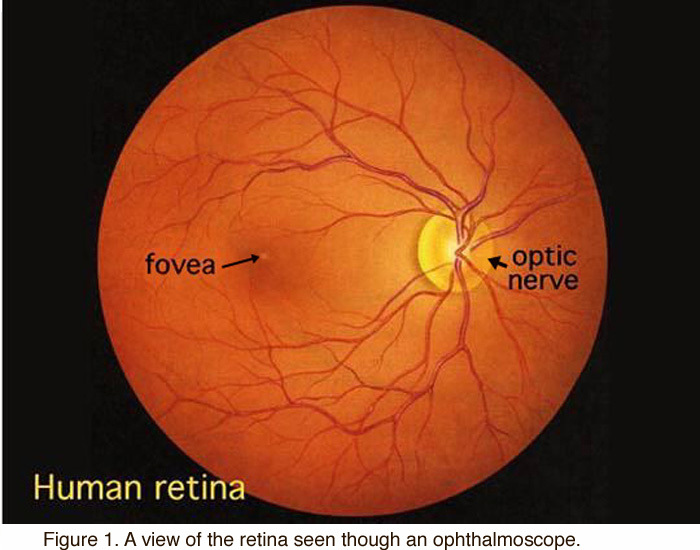 The fovea lies in the middle of the macula area of the retina to the temporal side of the optic nerve head (Fig. 13a, A, B). 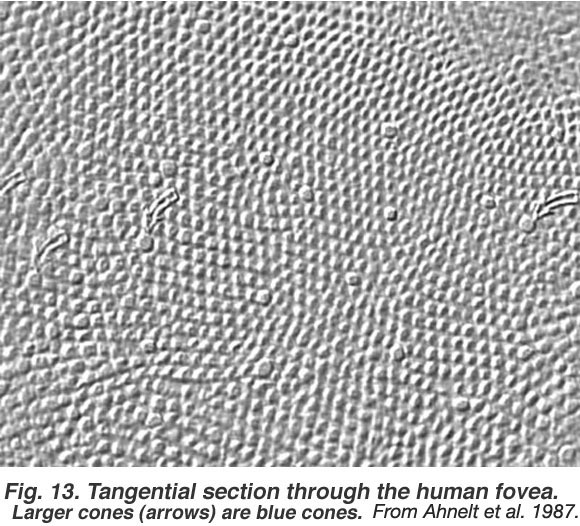 It is an area where cone photoreceptors are concentrated at maximum density, with exclusion of the rods, and arranged at their most efficient packing density which is in a hexagonal mosaic. 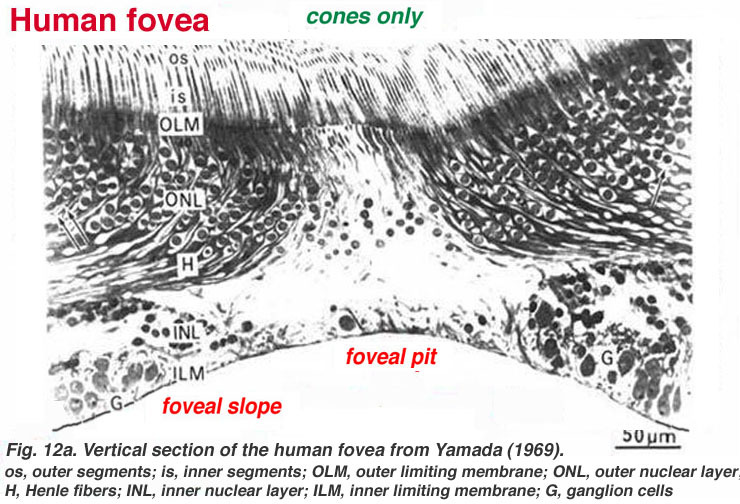 This is more clearly seen in a tangential section through the foveal cone inner segments (Fig. 13b). Fig 13a. A) fundus photo of a normal human macula, optic nerve and blood vessels around the fovea. B) Optical coherence tomography (OCT) images of the same normal macular in the area that is boxed in green above (A). The foveal pit (arrow) and the sloping foveal walls with dispelled inner retina neurons (green and red cells) are clearly seen. Blue cells are the packed photoreceptors, primarily cones, above the foveal center (pit). Below this central 200 micron diameter central foveal pit, the other layers of the retina are displaced concentrically leaving only the thinnest sheet of retina consisting of the cone cells and some of their cell bodies (right and left sides of Figs. 12a and 12b). This is particularly well seen in optical coherence tomography (OCT) images of the living eye and retina (Fig. 13a, B). 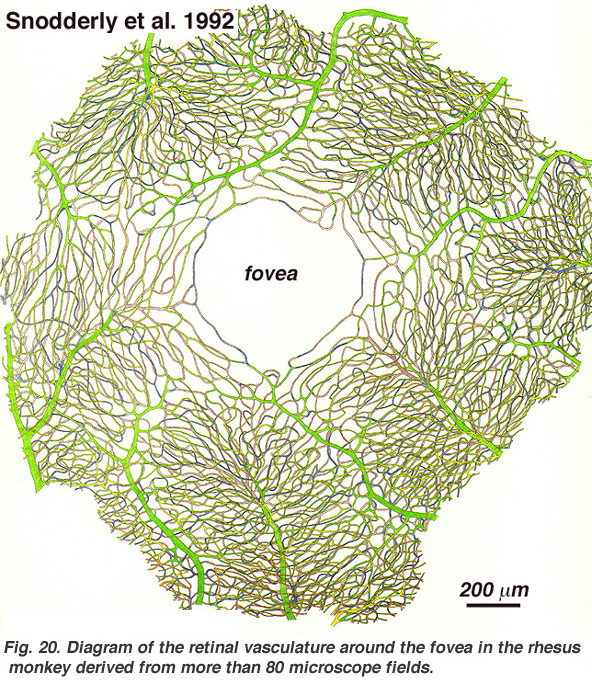 Radially distorted but complete layering of the retina then appears gradually along the foveal slope until the rim of the fovea is made up of the displaced second- and third-order neurons related to the central cones. Here the ganglion cells are piled into six layers so making this area, called the foveal rim or parafovea (Polyak, 1941), the thickest portion of the entire retina. The whole foveal area including foveal pit, foveal slope, parafovea and perifovea is considered the macula of the human eye. Familiar to ophthalmologists is a yellow pigmentation to the macular area known as the macula lutea (Fig. 14). This pigmentation is the reflection from yellow screening pigments, the xanthophyll carotenoids zeaxanthin and lutein (Balashov and Bernstein, 1998), present in the cone axons of the Henle fibre layer. The macula lutea is thought to act as a short wavelength filter, additional to that provided by the lens (Rodieck, 1973). As the fovea is the most essential part of the retina for human vision, protective mechanisms for avoiding bright light and especially ultraviolet irradiation damage are essential. For, if the delicate cones of our fovea are destroyed we become blind. The yellow pigment that forms the macula lutea in the fovea can be clearly demonstrated by viewing a section of the fovea in the microscope with blue light (Fig. 15). 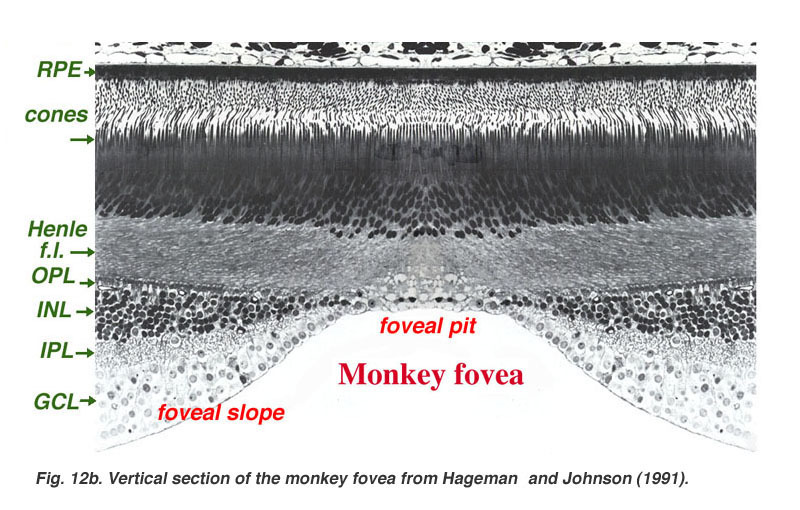 The dark pattern in the foveal pit extending out to the edge of the foveal slope is caused by the macular pigment distribution (Snodderly et al., 1984). 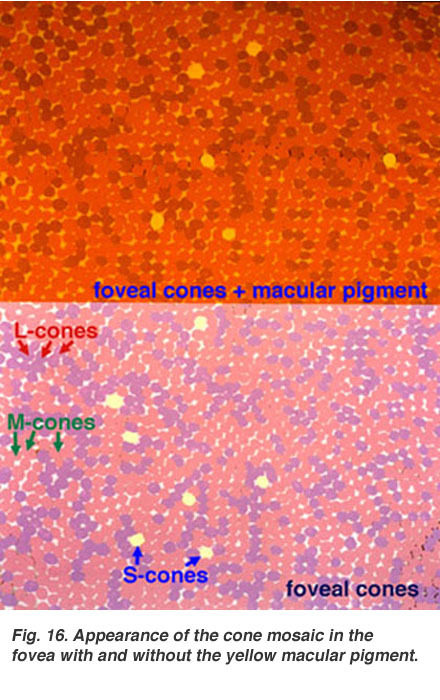 If one were to visualize the foveal photoreceptor mosaic as though the visual pigments in the individual cones were not bleached, one would see the picture shown in Figure 16 (lower frame) (picture from Lall and Cone, 1996). The short-wavelength sensitive cones on the foveal slope look pale yellow green, the middle wavelength cones, pink and the long wavelength sensitive cones, purple. 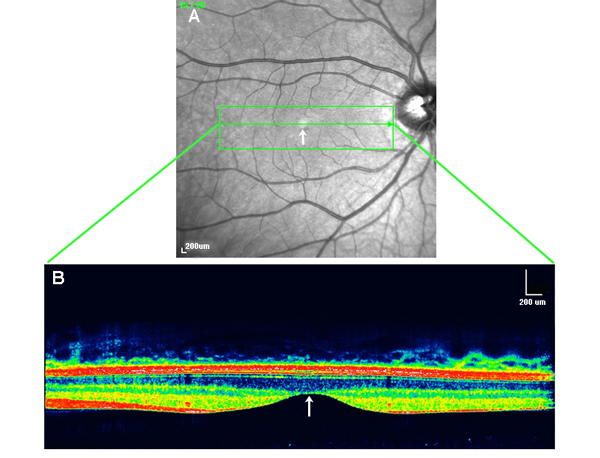 If we now add the effect of the yellow screening pigment of the macula lutea we see the appearance of the cone mosaic in Figure 16 (upper frame). The macula lutea helps enhance achromatic resolution of the foveal cones and blocks out harmful UV light irradiation (Fig. 16 from Abner Lall and Richard Cone, unpublished data). 6. Ganglion cell fiber layer. The ganglion cell axons run in the nerve fiber layer above the inner limiting membrane towards the optic nerve head in a arcuate form (Fig. 00, streaming pink fibers). The fovea is, of course, free of a nerve fiber layer as the inner retina and ganglion cells are pushed away to the foveal slope. The central ganglion cell fibers run around the foveal slope and sweep in the direction of the optic nerve. Peripheral ganglion cell axons continue this arcing course to the optic nerve with a dorso/ventral split along the horizontal meridian (Fig. 00). Retinal topography is maintained in the optic nerve, through the lateral geniculate to the visual cortex. 7. Blood supply to the retina. There are two sources of blood supply to the mammalian retina: the central retinal artery and the choroidal blood vessels. The choroid receives the greatest blood flow (65-85%) (Henkind et al., 1979) and is vital for the maintainance of the outer retina (particularly the photoreceptors) and the remaining 20-30% flows to the retina through the central retinal artery from the optic nerve head to nourish the inner retinal layers. The central retinal artery has 4 main branches in the human retina (Fig. 17). The arterial intraretinal branches then supply three layers of capillary networks i.e. 1) the radial peripapillary capillaries (RPCs) and 2) an inner and 3) an outer layer of capillaries (Fig. 18a). The precapillary venules drain into venules and through the corresponding venous system to the central retinal vein (Fig. 18b). The radial peripapillary capillaries (RPCs) are the most superfical layer of capillaries lying in the inner part of the nerve fiber layer, and run along the paths of the major superotemporal and inferotemporal vessels 4-5 mm from the optic disk (Zhang, 1994). The RPCs anatomose with each other and the deeper capillaries. The inner capillaries lie in the ganglion cell layers under and parallel to the RPCs. The outer capillary network runs from the inner plexiform layer to the outer plexiform layer thought the inner nuclear layer (Zhang, 1974). The choroidal arteries arise from long and short posterior ciliary arteries and branches of Zinn’s circle (around the optic disc). 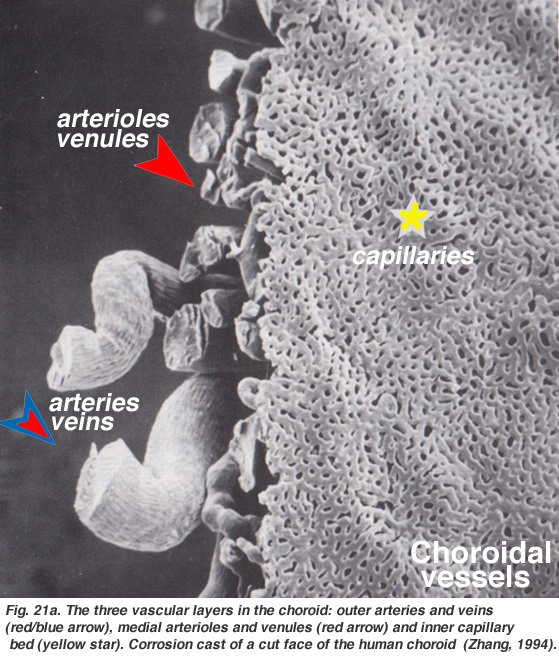 Each of the posterior ciliary arteries break up into fan-shaped lobules of capillaries that supply localized regions of the choroid (Hayreh, 1975). 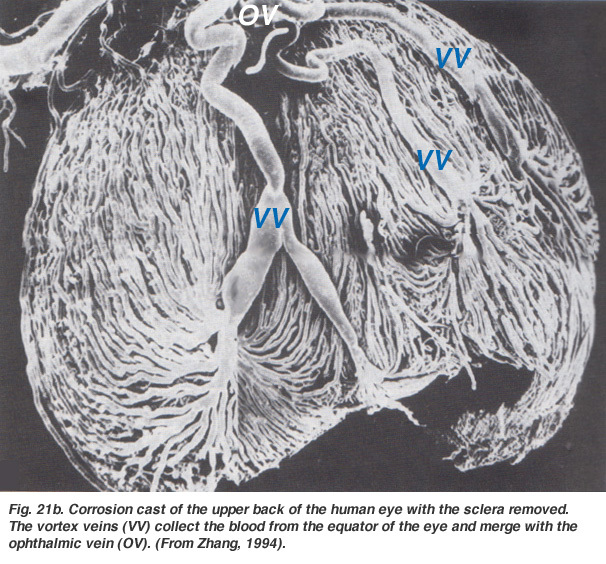 The macular area of the choroidal vessels are not specialized like the retinal blood supply is (Zhang, 1994). The arteries pierce the sclera around the optic nerve and fan out to form the three vascular layers in the choroid: outer (most scleral), medial and inner (nearest Bruchs membrane of the pigment epithelium) layers of blood vessels. This is clearly shown in the corrosion cast of a cut face of the human choroid in Figure 21a (Zhang, 1974). The corresponding venous lobules drain into the venules and veins that run anterior towards the equator of the eyeball to enter the vortex veins (Fig. 21b). One or two vortex veins drain each of the 4 quadrants of the eyeball. 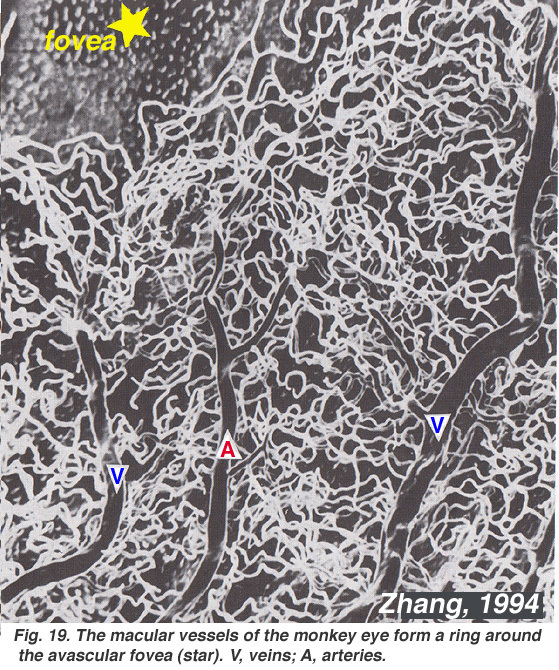 The vortex veins penetrate the sclera and merge into the ophthalmic vein as shown in the corrosion cast of Figure 21b (Zhang. 1994). Fig. 21b. Corrosion cast of the upper back of the human eye with the sclera removed. The vortex veins collect the blood from the equator of the eye and merge with the ophthalmic vein. (From Zhang, 1994). 8. Degenerative diseases of the human retina. The human retina is a delicate organization of neurons, glia and nourishing blood vessels. In some eye diseases, the retina becomes damaged or compromised, and degenerative changes set in that eventally lead to serious damage to the nerve cells that carry the vital mesages about the visual image to the brain. We indicate four different conditions where the retina is diseased and blindness may be the end result. Much more information concerning pathology of the whole eye and retina can be found in a website made by eye pathologist Dr. Nick Mamalis, Moran Eye Center. Fig. 22. 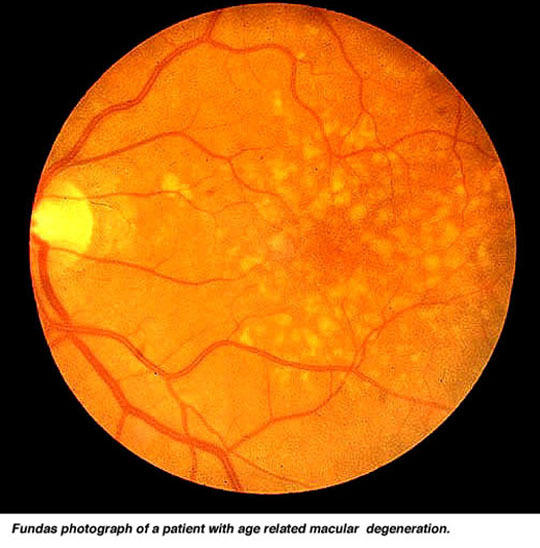 A view of the fundus of the eye and of the retina in a patient who has age-related macular degeneration. Fig. 23. 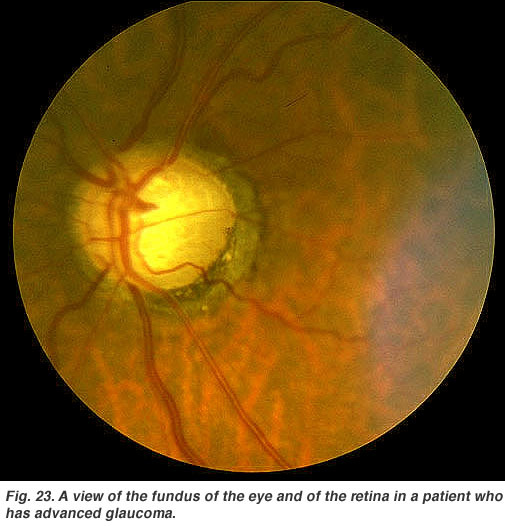 A view of the fundus of the eye and of the retina in a patient who has advanced glaucoma. Age related macular degeneration is a common retinal problem of the aging eye and a leading cause of blindness in the world. The macular area and fovea become compromised due to the pigment epithelium behind the retina degenerating and forming drusen (white spots, Fig. 22) and allowing leakage of fluid behind the fovea. The cones of the fovea die causing central visual loss so we cannot read or see fine detail. Glaucoma (Fig. 23) is also a common problem in aging, where the pressure within the eye becomes elevated. The pressure rises because the anterior chamber of the eye cannot exchange fluid properly by the normal aqueous outflow methods. The pressure within the vitreous chamber rises and compromises the blood vessels of the optic nerve head and eventually the axons of the ganglion cells so that these vital cells die. Treatment to reduce the intraocular pressure is essential in glaucoma. 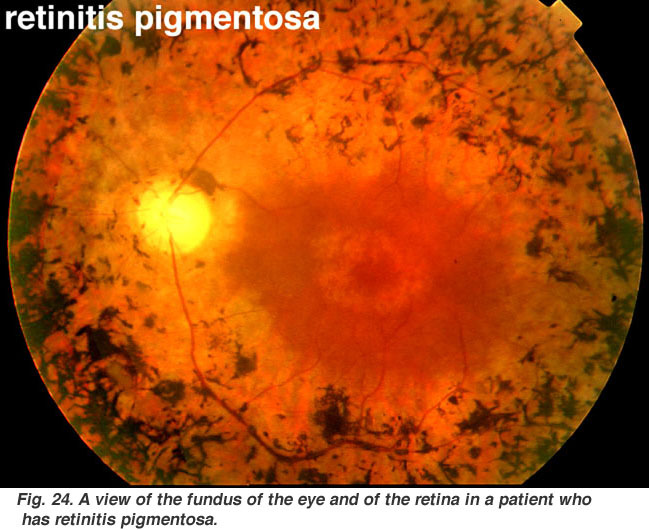 Retinits pigmentosa (Fig. 24) is a nasty hereditary disease of the retina for which there is no cure at present. It comes in many forms and consists of large numbers of genetic mutations presently being analysed. Most of the faulty genes that have been discoverd concern the rod photoreceptors. The rods of the peripheral retina begin to degenerate in early stages of the disease. Patients become night blind gradually as more and more of the peripheral retina (where the rods reside) becomes damaged. Eventally patients are reduced to tunnel vision with only the fovea spared the disease process. 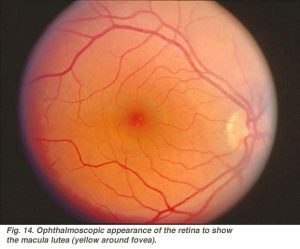 Characteristic pathology is the occurence of black pigment in the peripheral retina and thinned blood vessels at the optic nerve head (Fig. 24). Diabetic retinopathy is a side effect of diabetes that affects the retina and can cause blindness (Fig. 25). The vital nourishing blood vessels of the eye become compromised, distorted and multiply in uncontrollable ways. Laser treatment for stopping blood vessel proliferation and leakage of fluid into the retina, is the commonest treatment at present. Balashov NA, Bernstein PS. Purification and identification of the components of the human macular carotenoid metabolism pathways. Invest Ophthal Vis Sci.1998;39:s38. Hageman GS, Johnson LV. The photoreceptor-retinal pigmented epithelium interface. In: Heckenlively JR, Arden GB, editors. Principles and practice of clinical electrophysiology of vision. St. Louis: Mosby Year Book; 1991. p. 53-68. Harrington, D.O. and Drake, M.V. (1990) The Visual Fields, 6th ed. Mosby. St. Louis. Henkind P, Hansen RI, Szalay J. Ocular circulation. In: Records RE, editor. Physiology of the human eye and visual system. New York: Harper & Row; 1979. p. 98-155. Kolb H. The neural organization of the human retina. In: Heckenlively JR, Arden GB, editors. Principles and practices of clinical electrophysiology of vision. St. Louis: Mosby Year Book Inc.; 1991. p. 25-52. Polyak SL. The retina. Chicago: University of Chicago Press; 1941. Rodieck RW. The vertebrate retina: principles of structure and function. San Francisco: W.H. Freeman and Company; 1973. Van Buren JM. 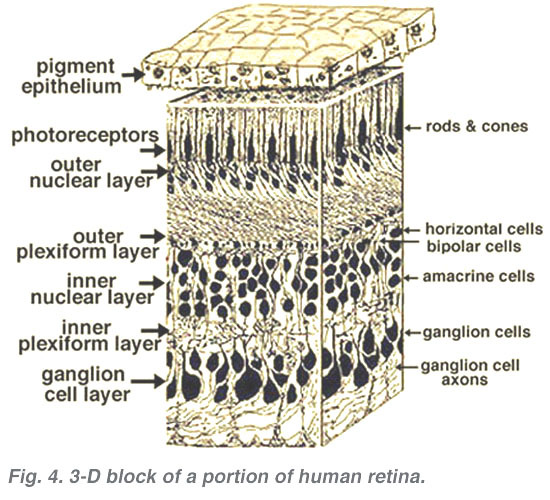 The retinal ganglion cell layer. Springfield (IL): Charles C. Thomas; 1963. Zhang HR. Scanning electron-microscopic study of corrosion casts on retinal and choroidal angioarchitecture in man and animals. Prog Ret Eye Res. 1994;13:243–270. Last Updated: October 8, 2011.